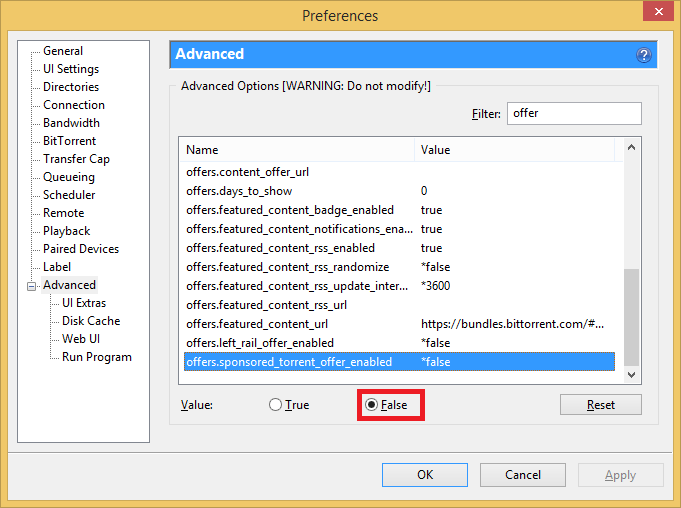 The popular microtorrent client uTorrent has grown so popular that the developers decided to monetize it with some ads. 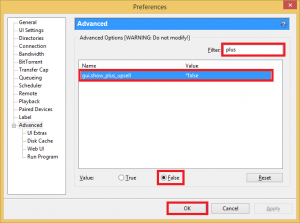 I mostly use the WebUI remotely so the ads don’t affect me but removing ads seems to be quite popular so here is a guide to do it that should increase performance on older systems and decrease the risk of seizure from these flashy ads. 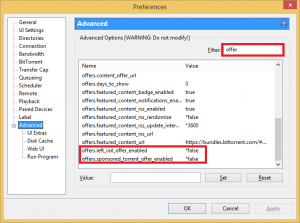 Removing the uTorrent 3.x ads from the interface will take about 2 minutes. 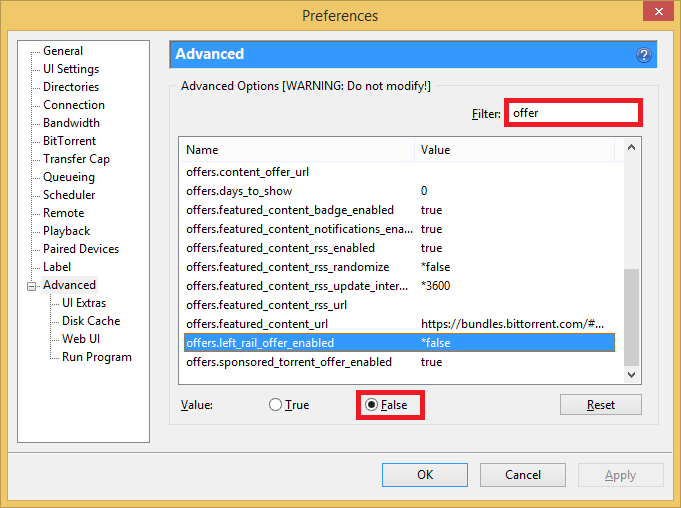 uTorrent ads are flashy and ugly, unpleasing to the eye and often include sexual content. 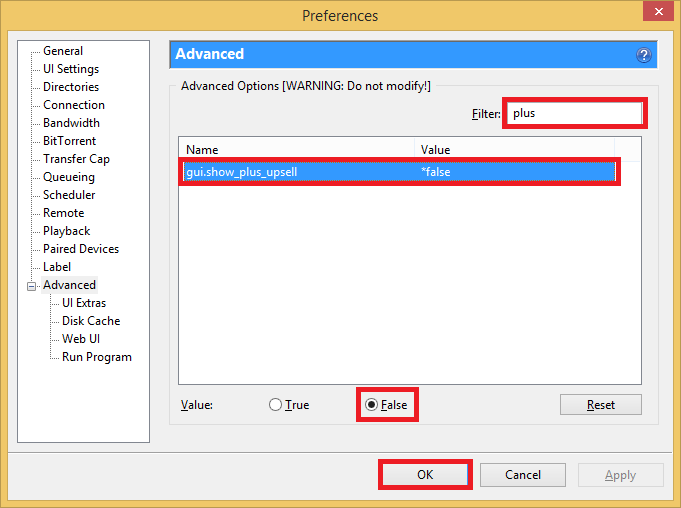 Click Ctrl+P to open up preferences and click Advanced. We need to change three values. Enter offer in the Filter box and change the offers.left_rail_offer_enabled and offers.sponsored_torrent_offer_enabled. Now uTorrent is all clean, you may need to exit and reload for the upper toolbar to disappear but it will be clean when you reload. 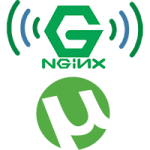 Enjoy your ad free torrent experience :). Make sure you are using a VPN like Private Internet Access or PureVPN to avoid copyright infringement letters from your ISP (see Usenet Compared to Torrents). Also consider automating your torrenting experience with SickRage, Sonarr and CouchPotato guides found in the menu bar for all operating systems.